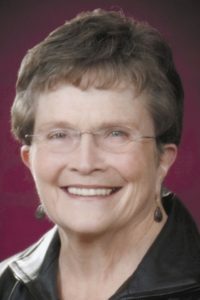 It was an adventurous spirit, as her children like to recall, that inspired Erlene Darby to do many of the things she did throughout her 79 years of life. In 1970, it was that spirit that led Erlene and her kids on an impromptu, 3-month road-trip across the United States. Erlene clearly loved traveling and experiencing life. But she was also was well-known for her sympathetic ear and kind heart, and she was always ready to support family, friends, and her credit union. “I had thought of a number of words to describe her and came up with committed, caring, leadership, supportive. She mentored me both professionally and personally. And she did it from the heart. That meant a lot to me.” — Debi Smiley, Chief Marketing Officer at Wauna Credit Union. Erlene Darby volunteered at Wauna Credit Union for over 30 years. She served in almost every capacity. From Board Chair to Board Treasurer, she did it all. Erlene watched the credit union grow and change — her adventurous spirit, a beacon, guided the credit union through ups and downs. So, in recognition of this steadfast commitment to Wauna Credit Union, to her adventurous spirit, and to the inspiration and wonder she shared throughout her three decades with us, we are proud to announce the dedication of our Westport Learning Center to Erlene Darby. “I think dedicating this building – the learning center for all of the future and current employees and volunteers that we’re going to have here at Wauna – to come through and to see her name and her image says a lot about what she stood for,” said George Dunkel, WCU’s Board Chair. 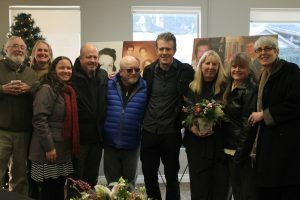 As a special way of celebrating Erlene, we hosted a small ceremony dedicating the “Erlene Darby Learning Center.” There, joined by Erlene’s family and friends, we shared laughs and tears. While the mood was light, the memories and feelings were strong. The affair became a proud moment forever marked in time for not only Wauna Credit Union, but for Erlene’s family. 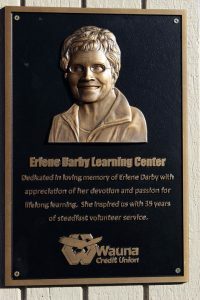 Dedicated to the loving memory of Erlene Darby with appreciation of her dedication and passion for lifelong learning. She inspired us with 35 years of steadfast volunteer service.